They picked the right place for a captive audience. Activists opposed to Arizona's immigration law plan to hold banners Monday morning on freeway overpasses in downtown LA. Arizona's law (Full Text Here), which empowers local law enforcement to check the immigration status of suspects they have stopped for other reasons, is to go into effect Thursday, unless legal efforts to stop it are successful. A group of activists calling themselves "We Are All Arizona" plan to hold banners while standing on the Broadway Avenue, Spring Street and Grand Avenue overpasses to the Hollywood (101) Freeway in downtown Los Angeles during rush hours -- 7 a.m. to 9 a.m. and 4 p.m. to 6 p.m. The group announced it would do the same thing Tuesday and Wednesday, and is planning a "major action'' on Thursday. Although it is illegal to hang banners from freeway overpasses, it is legal to hold banners as long as no state property is damaged, said Los Angeles police Sgt. Andy Mathes, who also said the group had not told authorities about the protest. They picked the right place for a captive audience. Activists opposed to Arizona's immigration law are using banners on freeway overpasses in downtown LA. 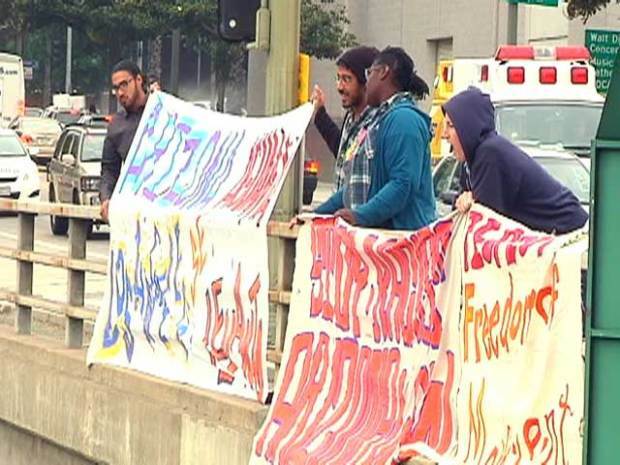 In another protest of the pending law, 14 members of the same group were arrested May 6 when they sat down in the street and blocked the entrance to the Federal Detention Center in downtown Los Angeles.